The Beatles Song Of The Day is “Roll Over Beethoven.” “Roll Over Beethoven” is the first song on side 2 of The Beatles second album “With The Beatles.” The song was written by the father of rock and roll Chuck Berry. John Lennon: rhythm guitar, handclaps/ Paul McCartney: bass guitar and handclaps/ George Harrison: double-tracked vocal, lead guitar and handclaps/ Ringo Starr: drums, handclaps. The song was recorded at Abbey Road on July 30th, 1963. Producer: George Martin. Between 1957-66 The Beatles covered more Chuck Berry songs than anyone else who they covered during the concerts. John was the biggest Chuck Berry fan among the group but George Harrison does the singing duties on this cover. Not as great a version as Mr. Berry’s but pretty darn good. 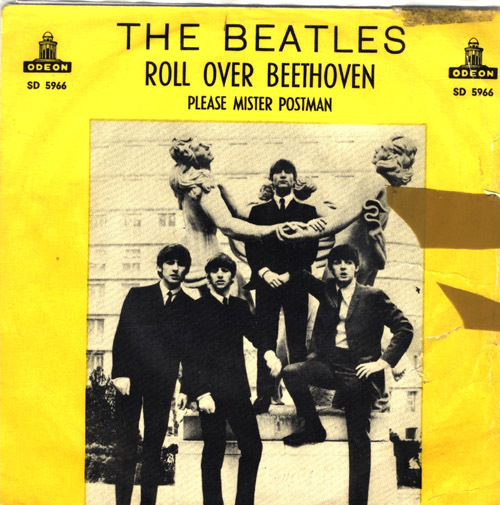 “Roll Over Beethoven” is one of my favorite rock & roll covers by The Beatles. An even better version, in my opinion, is on the excellent Rolling Stones BBC compilation “On Air”, which was released late last year. And while it’s a bit weird, I also like the version by E.L.O. I just find it intriguing how they blended Beethoven’s 5th Symphony with Chuck Berry’s classic rock & roll tune.